What would the Bay Area be like without farms and ranches? Imagine our region without the range and farm lands that bring us a bounty of local produce, fresh meats and dairy products, and the inspiring landscapes and ecosystems that define the Bay Area. Sooner than we realize we may lose this – unless the region’s agriculture can be sustained as a successful economic sector and valued for the productive land and ecosystems that supply us with a multitude of beneficial resources. Since 1984, more than 200,000 acres of agricultural land in the nine-county Bay Area have been lost to development. Much of the region’s urban footprint was carved from irrigated cropland, the most productive and versatile land for food production. It is this high quality land that still remains the most vulnerable to development. Today, only 367,000 acres of this critical resource are still in production and much of it is up for grabs. With almost two million more people expected to live in the region by 2035, it is imperative that strong local land-use policies and conservation investments assure that the best remaining farm and ranch lands are preserved and that development consumes as little of it as possible. But preserving the land is not enough. The one thing that distinguishes agricultural land from all other kinds of open space is that, by definition, it provides for a basic human need. Neither the food produced on agricultural land, nor its other public benefits – its scenic beauty, its environmental value as undeveloped watersheds and wildlife habitat, its historic character and cultural significance, its very presence as a bulwark against urban sprawl – can be guaranteed unless agriculture itself succeeds financially. This recognition was behind a key recommendation of the Bay Area Open Space Council, Greenbelt Alliance, and Association of Bay Area Governments (ABAG) in a 2009 report entitled Golden Lands, Golden Opportunity: Preserving Vital Bay Area Lands for All Californians: Help keep the region’s farmers and ranchers in business. Close to urban areas, Bay Area farmers and ranchers are under more pressure than their counterparts in more rural areas of the state. The cost of land and other inputs is higher and the potential for conflict with urban uses is greater. To stay in business, agriculture in this region must overcome these competitive disadvantages. And to do that, it needs the understanding and active support of the public, not only as consumers who can exert influence through their buying power, but also as constituents who can influence public policies that impact agriculture. The Bay Area Agricultural Sustainability Project was inaugurated to keep the region’s agriculture competitive and economically viable. It is intended to help farmers and ranchers overcome the challenges they face, and to maximize their opportunity to capitalize on the advantage they enjoy due to their proximity to seven million customers. In so doing, this project seeks to maximize all of the contributions that agriculture makes to the livability and sustainability of the region as a whole. The Bay Area’s agricultural land is not a placeholder for future development, nor simply preserved open space that will help prevent urban sprawl and all of its undesirable consequences – though that is surely one of its important functions. The Bay Area Agricultural Sustainability Project envisions a working landscape that continues to enrich the region for many generations to come as an irreplaceable environmental, cultural, and historic resource that supplies healthy food to the region’s residents and visitors, while supporting farm and ranch families who are pillars of the metropolitan community. 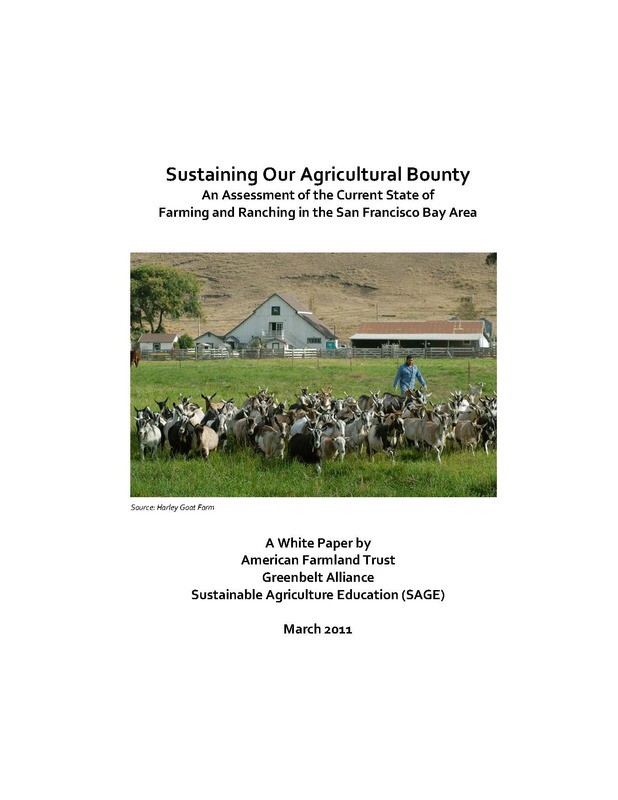 The Bay Area Agricultural Sustainability Project consists of two components: 1) this white paper, the product of reconnaissance to document the defining characteristics of the region’s agriculture and to identify the challenges and opportunities encountered by the region’s farmers and ranchers; and 2) a convening in early 2011 of a group of regional leaders from agriculture and other constituencies to consider the information in the white paper, along with their own experiences, and to begin designing a comprehensive strategy to assure a robust and sustainable future for Bay Area agriculture. The project is a collaboration among three nonprofit organizations: Greenbelt Alliance, Sustainable Agriculture Education (SAGE), and American Farmland Trust. 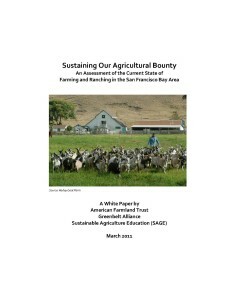 It was inspired by an Urban-Rural Roundtable convened in 2008 by former San Francisco Mayor Gavin Newsom, which, among other things, recommended that a concerted effort be made to realize the full potential of the region’s agricultural land and producers to supply the region’s growing demand for local food.